Easy Sloppy Joes are the easiest, quickest way to get dinner on the table when you’re in a rush. You will turn to this recipe when you need something ready in about 20 minutes. This is a great family friendly recipe that’s oh so tasty! 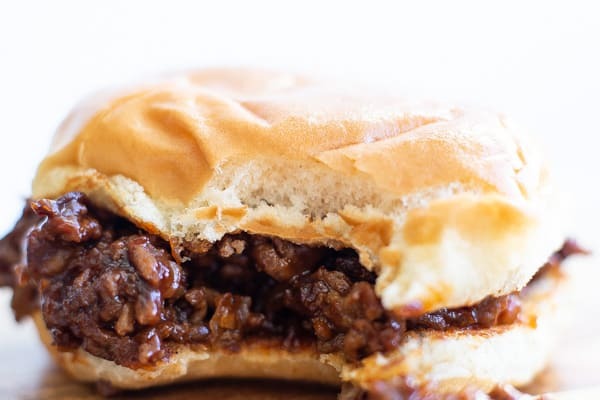 These Easy Sloppy Joes never disappoint in my house. 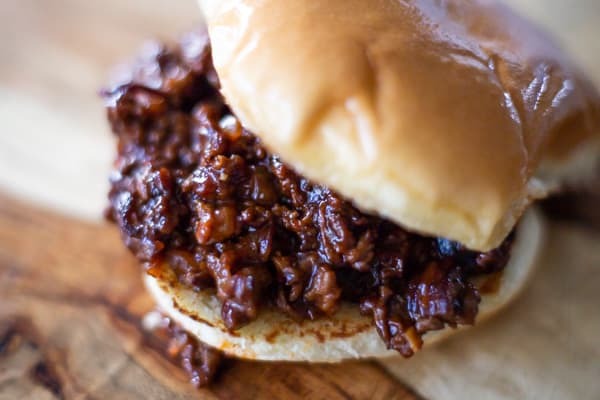 Whether it’s just me and my man or a house full of kids, this quick and simple sloppy joe recipe aways gets the A-OK from all. Be sure to use a skillet large enough to brown the meat. I like to use a 10 inch or 12 inch cast-iron skillet or a non-stick skillet. Onions are totally optional. Some folks just don’t like onions. When my kids were little, I usually skipped the onions or used a small amount and chopped them very fine. If you want onion flavor with out the onions, try adding a teaspoon of onion powder instead. If you’re using onions, you can throw them in with the beef instead of cooking them separately. If you can find spicy or jalepeño ketchup, I highly recommend it! You can also just add a dash or two of red pepper sauce. Regular ketchup works well too. Oh, and be sure to butter the buns. So good! 4 Hamburger buns, buttered and toasted. Heat oil in a cast iron or non-stick skillet. Brown beef, drain fat if desired. Remove cooked beef and set aside. Sauté onions in beef drippings until soft and slightly caramelized. Add garlic and sauté for about one minute. Add cooked beef back into pan. Sprinkle with salt and pepper to taste. Add the bbq sauce, ketchup, and mustard to beef mixture. Stir to combine. Let it simmer on low heat while you prepare the buns, or about 5 minutes. Heat another skillet or griddle pan. Add enough butter to skillet to coat the surface. Place buns (inside down) on the skillet and toast for about one minute. Repeat in batches if necessary. Brush melted butter over top of bun, if desired. Scoop ¼ of the beef mixture onto bottom bun. Top with cheese, fixins, and top bun. I used Sweet Baby Rays BBQ sauce in this recipe. Nutritional information provided is an estimate and doesn’t include cheese or fixins. 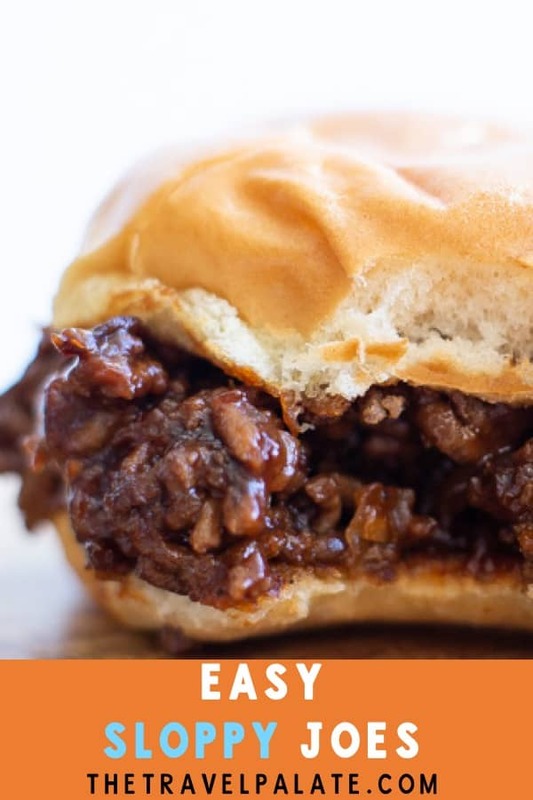 If you made this Easy Sloppy Joes recipe, or any other recipe on the blog, don’t forget to leave a rating and a comment below. I love hearing from my readers! You can also find me on Facebook, Instagram and Pinterest! This sounds like a perfect family dish infused with many amazing flavours. I’ve never had these so can’t wait to try. They look delicious! Sloppy Joes are such a perfect, family friendly meal! I still love them! I love the thought of using the spicy ketchup and buttering the buns. I’ve never heard of that! Brings me back to being a kid! These Sloppy Joe’s looks SO yummy! Yum!!! This looks and sounds great. Can’t wait to try it!